Miss Patisserie: Best Chocolate Chip Cookies in San Francisco! Best Chocolate Chip Cookies in San Francisco! In honor of National Chocolate Chip Cookie Day (May 15th), I have decided to spotlight my favorite chocolate chip cookies in San Francisco. Anthony's Cookies in the Mission District makes wonderful cookies that truly taste homemade. That's because the cookies are baked fresh every day from the finest local organic ingredients. Anthony's makes eight different types of chocolate chip cookies, all delicious in their own way: Classic Chocolate Chip, White Chocolate Chip, Double Chocolate Chip, Dark Chocolate Chip, Walnut Chocolate Chip, Walnut Double Chocolate Chip, Oatmeal Chocolate Chip and Double Dark Chocolate Chip. 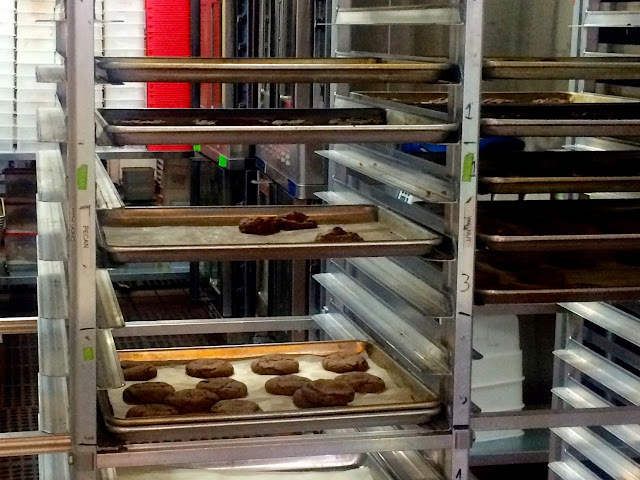 Since Anthony's only sells cookies that are freshly baked in the morning, by afternoon many of the cookie varieties are sold out. 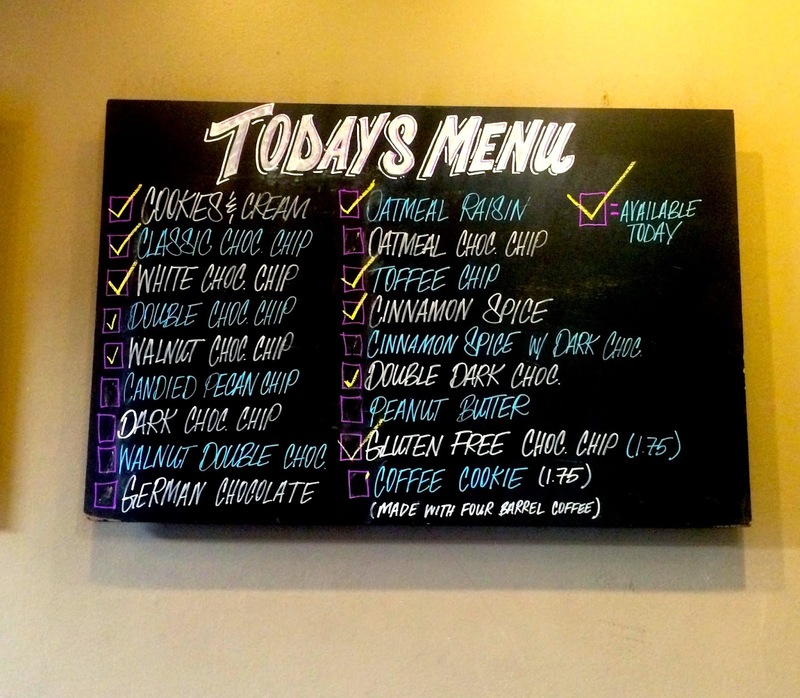 The shop's chalkboard menu displays a list of the 18 different varieties with a checkmark next to what's available. The cookie racks in the kitchen are constantly being replenished with freshly baked cookies. If you're lucky, you'll arrive right after a batch has been baked... when the aroma is so enticing! Who can resist warm cookies with melty chocolate chips? Three favorite types of chocolate chip cookies: white chocolate chip, double chocolate chip and dark chocolate chip. My favorite is the Double Dark Chocolate Cookie. This is a sophisticated cookie, very rich and chocolate. It's also less sweet than the classic American chocolate chip cookie. My second favorite variety is the Dark Chocolate Chip Cookie. It's made with 72% cocoa bittersweet chocolate chips. Notice how this cookie is so densely packed with chocolate chips. It's a chocolate chip cookie lover's dream! Anthony's cookies are delicious with a piping hot cup of coffee or a frothy cappuccino! So it's not surprising that Anthony's supplies its cookies to local coffeeshops including Four Barrel Coffee, Coffee Bar and Café Roma. Anthony's cookies and cappuccino is the perfect combination! You can also order cookies to be delivered Monday through Saturday (between 10am and 2pm). The delivery fee is $20 but that's worth it when you consider that you've avoided the hassle of parking in the Mission! Is this more of a To Go place or are there sit down tables? Hi Van! Anthony's is just a small bakery with one communal table inside the shop. Most people take their cookies to go. It's also possible to have the cookies delivered! My new favorite day is May 15th! And my mouth is watering looking at the pictures, I am going there this weekend! Liz, the cookies are even better than they look, especially when they're just out of the oven and still warm! You'll love this place! Those cookies look great. I need to try them soon! You definitely should check out this place! It's a fun place to stop for a treat in the Mission!